Vinson House before the HRA redevelopment. 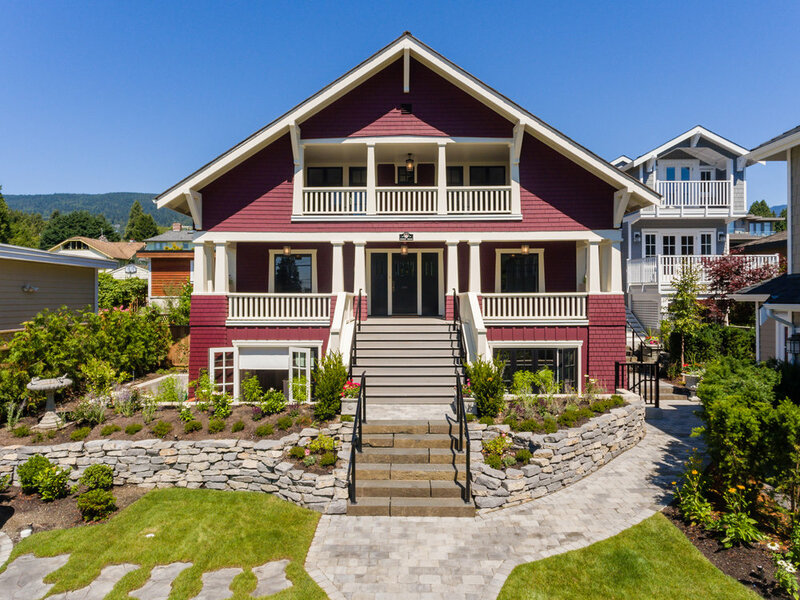 The Vinson House is a large, Craftsman-style bungalow which used to sit on an over-sized lot in the lower Ambleside area of West Vancouver. It sits on the southern edge of what was originally a 5.4-acre lot, which was a typical real estate purchase at the time. The property was subdivided in 1940 and the original house retained one-quarter of an acre of land. It was built in 1913 for Valient Vinson, who was Reeve (Mayor) of West Vancouver in the 1920’s. On June 6, 2016 the "Vinson House" became a legally protected heritage resource when Council approved the Heritage Designation Bylaw and the Heritage Revitalization Agreement. At the time of writing, the construction of the laneway and garden cottages had not yet begun. Vinson House, Gordon Avenue, West Vancouver, built in 1913. Vinson House in 2018, following HRA. Interior of Vinson House following HRA restoration. Upper balcony of Vinson House following HRA restoration. Aerial view of property showing Vinson House and the two new detached dwellings.